My Family Project is based on a typewritten genealogy from my Great-Aunt Ida Scofield and my own personal history. I am started out tracing two brothers, Daniel Scofield & Richard Scofield, who settled in Connecticut in the 1640's. My work quickly expanded to include the Crossno's and McIlmurray's. The Scofield's were based on Connecticut for several generations but as the country started to expand and grow they spread their roots to New York, Ohio, Michigan and beyond. My branch settled in Hale, Iosco County Michigan in the early 1900's. They farmed in that area for many years being very involved in the community. The McIlmurray's side of the family first came to America thru Canada. 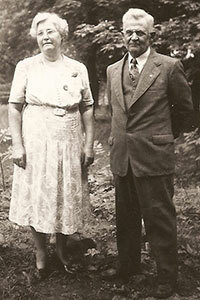 James and Fanny McIlmurray were based in Six Mile Cross, County Tyrone, Ireland. Most of their 8 children (6 sons and 2 daughters) immigrated to Canada. From Canada they spread down thru New York, Michigan and out west. This is a challenging family to track down since there are variety of spellings to the name, ie: McIlmurray, McElmurry, McElmurray, McElmury. I am also tracing my husband's family, the Crossno's. My father-in-law was born in Arkansas and was one of seven children. It has been difficult to trace his family because there seems to be several different spellings (Crossno, Crosno, Crosnoe) and father-in-law's reluctance to talk about his family. But, this is what a genealogist lives for, a challenge!